I think I started playing around with self portraits because they’d always been something that photographers and artists have done for centuries, and I was fascinated by the idea of it. As if it was an idea reserved for the artistic types. Usually, an artist would have one or two self works in their repertoire or maybe an artist would choose to use themselves so often as a subject that that would be the focus of their art or statement. Nowadays in the time of the selfie, which in truth is just a lot of self portraits, it seems silly to focus on the self as a subject matter. The subject of the self has been saturated with the selfie, and fb, and Instagram, and the long list of future picture apps. I’d always felt self-conscious of taking pictures of myself. I had thought it would make me appear to be vain. I was never certain where this fear of appearing vain came from, but it was as heavily laden with middle school gym room taunts as getting too fat or not shaving your legs. Self-portraits were reserved for the artists, and the conceded or artistically conceded like Andy Warhol and his entourage. I’m not making these statements now as facts, but as ways I had in thinking about myself and how much of myself I was “allowed” to show or share or express. It was very little. Somewhere between the birth of the internet and the birth of cell phones, and social media taking pictures of everything from food, to fights, to shoes, to art work, to selfies became fair game and the idea of it as some expression of “art” seemed to vanish. It turned to the expression of who could make themselves look the coyest, the cutest, the coolest, and more of the “EST-es”. This new world obsession with the self didn’t really come to me as a “do as the Roman’s do” type of thing but came out of an experience of a failed game with the “Romans”. I realized that I can’t take a selfie. I actually lack the skill to make the faces, the poses, and the perfect angles. I never learned the tricks. I’d like to blame it on my age, but I’ve seen plenty of people my age succeed at the selfie. The other thing was I noticed no one takes a very good picture of me. I have the kind of face that can look really bad in a photo. The angle can be done so perfectly wrong that I look a lot like I have a shrunken head. I blame myself. It comes down to the same problem as the selfie issue. I can’t pose. I feel weird. There’s something really fake about the whole event. I love the natural poses. The moments when we are in motion or when we are unaware of our photo being taken. Those are the pictures I like. Those are the pictures I want to see of myself. The image of life in motion captured on film not life posed to be captured on film. Everything feels like a selfie and a pressed smile. I don’t like having my photos taken. I liked the mirror. As a child I would spend hours in front of the mirror. I would pretend that the girl I was looking at and talking to was someone other than me. She looked like me but she was better than me, and she lived in a world I couldn’t see. A world that only looked similar in the mirror, but beyond her bedroom door was something very different. 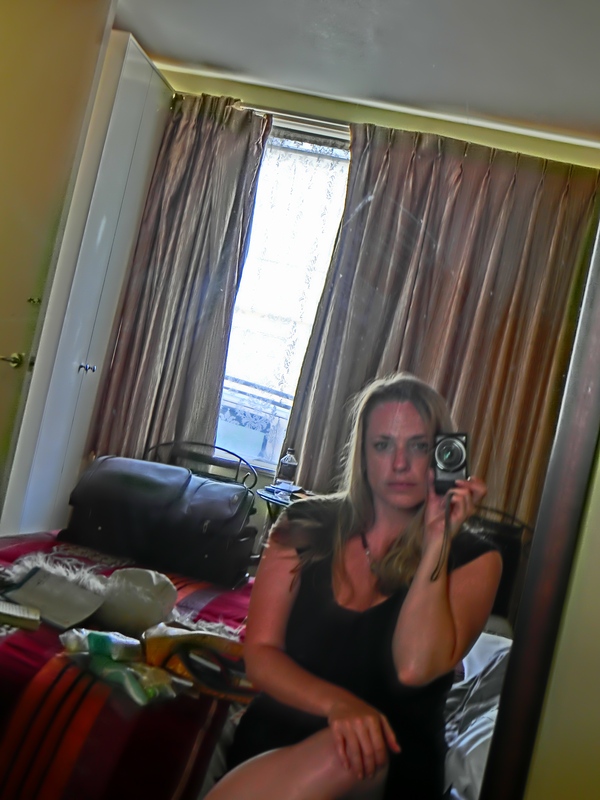 There was something about taking pictures of me in the mirror that was removed from taking actual photos of myself. It was me, but not. The reflection made me a little different. It suddenly began to feel like I was taking a picture of another person, something that I do enjoy doing. I began playing with this idea of posing but pretending not to pose or to be blatant with the use of the camera. Yes, there is a camera in the picture. It is backwards. Books are backwards, poses are backwards, angles are backwards. I don’t think any of the photos will matter to me until I’m an old lady. That’s where my curiosity really lies. How will I age? Will I miss my younger face? Will I recognize her? Will I still pose with her in the mirror? What if I don’t make it to be an old lady? Where will the pictures go? Does it matter if they go anywhere? Maybe, they will return to the mirror to that place beyond this place. Greetings, Adrienna. I don’t really see anything wrong with your self-portrait. Looks good to me. It’s a bit blurry, but that may be due to the Internet. Be Well. Hi Adrienna — I just discovered your YouTube videos and blog. I also moved to Zhengzhou last August to teach English for a school year. I’ve been blogging about the experience at rickwarner52.com. I’m a journalist who is going to turn the blog into a book when I return home to the U.S. I’d love to talk to you about your experience in Zhengzhou before I leave next month. If you’re willing, please let me know the best way to get in touch. Thanks, Rick. Hello Rick- You can contact me through my e-mail. I’ll send it to you via your e-mail address on your blog.